What may be the possible sources of obtaining information in respect of client’s business for the purpose of preparation of an audit plan? Minutes of directors and shareholders. Significant contracts such as loan agreements, leases and labor agreements. Trade and industry journals relating to client’s industry. Tour the factory and offices of client. Discussion of audit matters with internal auditor. Cash flows, budgets, and other management reports. What is planning memorandum and what information it should contain? Audit planning memorandum sets out general strategy. It is necessary that not only audit be properly planned, but evidence should also be placed on the file that adequate planning has been carried out. Problems experienced in previous years’ audit. Client’s use of computer system. Agreement on dates to perform test of control. Assistance to be obtained by the client. Certificates and letter of representation to be obtained from the client. Timings for attendance of physical count. List down schedules that you would require the client to repare before starting final audit. Schedule of fixed assets showing reconciliation of costs and depreciation, beginning and end of period. The management of Mehran Industries Ltd, a listed company has asked you to carry out the audit for year ending June 30, 20 x 4. List down matters to be considered before you can accept the audit of Mehran Industries Limited. Evaluate firm’s ability to serve the client including technical skills, knowledge of the industry and expertise required. Inquire bankers and others in the business community who may have knowledge about the integrity of prospective client. Your client Micros Associates is engaged in trading of computers. The client has been audited by your firm for quite a few years. Micros Associates is owned by a sole proprietor who travels extensively out of country looking after his other global interests. He has hired a manager who has been given wide powers for hiring and firing the staff and make all significant business decisions. The company provides one-year warranty against its products. Sales are made on cash, credit and lease terms. Inadequate monitoring by the owner due to extensive traveling and excessive delegation of responsibility to a manger. Provision for warranty claims requires high degree of judgment. Sales on lease term may result in excessive doubtful accounts. Inherent risk may be high because the manger has excessive powers. Aftab Spinning Limited has been facing continuous losses since 20 x 1. The directors have been working hard to improve the situation. The company has 35,000 spindles and supplies yarn to shuttles loom customers. The annual installed capacity of the plant is rated at 4.8 millions kgs, of all counts. Actual efficiency is around 75%. Weak financial position has been bottleneck in obtaining further financial assistance from banks, who in turn, have to comply with prudential regulations. Discuss matters on which you would place relatively more emphasis in planning and performing the audit of Aftab Spinning. 1. The plant is working at a:substantially low capacity. We will have to see is it the recession in the industry as whole or the client is short of orders. 2. Due to weak financial position there may be unusual pressure on management to improve the gearing. The company may have deliberately resorted to off balance sheet financing. Some of the finance leases might have been treated as operating leases. Consider following example. 1. To improve the gearing, the Company. has treated a finance lease as operating lease. The asset and liability under finance lease were Rs. 200,000, Column. 2. presents the position after such adjustment. The debt equity ratio under the real situation may not be acceptable However by treating a finance lease as operating lease, the ratio seems acceptable. “Directors have been working hard to improve the situation” means that the control environment would be relatively strong. How does the auditor use knowledge of business:? Assessment of inherent risk. The auditor considers integrity of management, experience of management, nature of entity and nature of industry. More effective planning performing audit . Business risk are identified. Better service. Knowledge of business assist in making more practical recommendations to improve effective uses of entity’s resources . (i) Balance sheet audit approach (ii) Audit risk approaches (iii) Business risk approach. The auditor focuses on verification of balance sheet accounts only. 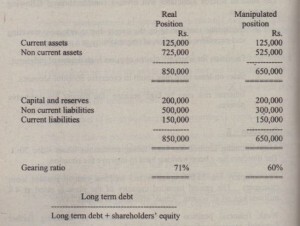 The contention is that if assets and liabilities are fairly stated, ‘shareholders’ equity is also fairly stated. If shareholders’ equity gives a true and fair view, and capita is verified, the income statement will also give a true and fair view of the results of operations and the cash flow will also not be materially misstated. Verification of assets, liabilities and capital balances. Test movements in the account balances. The approach is suitable in small businesses and also where the assets and liabilities are substantial in relation to revenues and expenses. The audit risk approach (risk based auditing) is the normal audit approach that has been discussed in the 400, risk assessment and internal controls. The approach was developed during 1980s. Risk based auditing ensure}, that more audit efforts are directed towards the areas which may cause financial statements most likely to be misstated. The benefit of this approach is that the change of detecting material misstatements is increased and unnecessary efforts are not spent on areas where the likelihood of material misstatements are low. The auditor makes an assessment of inherent and controls risk. He then uses this assessment to determine key audit areas and his substantive procedures. In an audit risk approach, the auditor is only interested in evaluating those risks and controls which affect financial statement assertions. In business risk approach the auditor reviews the business as whole and evaluates those control and risks which affect continuity if the business. The approach adds value to the client as the focus is on the businesses whole. Can goods be delivered but not invoiced? Can suppliers be paid for goods not delivered? Can employees be paid for work not performed? Can unauthorized payments be make? Change in fashion, tastes and style. Your firm has been appointed for first time to carry out the audit of Cole Enterprises for year ending December 31, 20 x 9. The entity is engaged in trading of office furniture and operates from 12 branches in various cities. Your communication with previous auditors revealed significant adjustments in inventories. The test of controls indicates material weakness in the cash receipts from customers and disbursement for expenses. Quarterly management accounts are available for your review. During the year the land and buildings were revalued by the directors. Set out significant matters to be considered in planning the audit of Cole Enterprises. Following matters will be considered in the audit planning of Cole Enterprises. 1. Visiting various branches or performing certain tests on surprise or unannounced basis. For example, observing inventory at locations where auditor attendance has not been previously announced or counting cash on a surprise basis. ·2. Requesting that inventories be counted at December 31, 20 x 9 or on a date closer to December 31, to minimize the detection risk between the date of completion of the count and year end. 3. Performing additional procedures during observation of count, for example requesting the cartons to be opened. Also see the gaps in the stacking of like items. 4. Comparing quantities for the current period with prior periods by class or category of furniture, and location. 5. 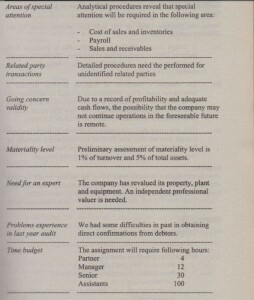 Comparing inventory turnover with other companies in the same trade. 6. Analyzing inventory shortage by locations. 7. Reviewing supporting documents for reduction to perpetual inventory records. 8. Confirming directly with customers the account activity. For major customers do not just. obtain confirmations but send statement of accounts. The confirmations should preferably be performed at or near year end. 9. Analyzing recovery of written off accounts. 10. Analyzing sales discounts and returns. 12. Reviewing expense reports submitted by branch managers. 13. Counting cash at or near year end. 14. Performing a detailed’ review of the entity’s quarterly management accounts and investigate unusual entries in the last quarter. 15. Performing substantive analytical procedures using disegregated data. For example, comparing sales and cost of sales by location. 16. Conducting interviews of personnel involved in areas where a risk of material misstatement due to fraud has been identified, to obtain their insight about the risks. • Consider experience and reputation of the valuers. • Obtain sufficient appropriate evidences that the scope of the work of independent valuers is adequate for the purpose of audit. • Consider source data used. • Evaluate assumptions and methods used. • Make inquiries regarding procedures undertaken by the independent valuers. • Review and test data used by the valuers. • Are there any related parties? • Are inventory levels increasing due to falling demand? You are audit incharge of Afro Chemical (Private Limited for year ending December 31, 2011, The company is engaged in manufacturing, purchasing and marketing of fertilizers including chemicals such as phosphoric, potassium and nitrogenous fertilizers like ammonia and urea. The company has recently established an internal audit department headed by a qualified internal auditor who reports to audit committed. Total assets of the company at October 31, 2011 amounted to Rs. 560 million, net profit Rs. 145 million and turnover Rs. 950 million. Long term debt amounted to Rs. 400 million. Recently, the company has computerized its accounting system by developing in house audit software. The management expects the auditor report on weaknesses in design and implementation of internal controls. Discuss matters that you would consider in developing audit strategy of Afro Chemicals (Private) Limited. Financial reporting framework is IFRS. Afro Chemicals has appointed an internal auditor. Preliminary assessment of internal auditing indicates that reliance may be made on the internal audit function as the internal auditor is a qualified person and directly reports to audit committee. This enhances the independence and objectivity of internal audit function. Later the specific work of internal auditing will have to be evaluated. Afro Chemicals is a highly geared company. Long term loans are about 70% of total assets. Care will have to be taken that financial statements are not manipulated to meet debt covenants. Afro Chemicals has offered the services of the staff. Such services can be utilized for preparing various schedules and other routine matters. Data has to be collected regarding competitive environment, customer relationships, source of supplies, annual demand, energy problems. Business risks in Afro Chemicals arise from the fact that the company operates in a highly regulatory environment. Non compliance of laws and regulations may have a significant affect over the operations and financial statements. Compliance with environmental policies will have to be reviewed to the extent such policies affect financial statements. Afro is also exposed to the risk that the chemical industry operates in a significant competitive environment. The risk may increase the risk of material misstatement in allowance for doubtful accounts and valuation of inventories. Approval and review procedures of transactions and events. Volume of transactions and audit approach. Assessment of inherent risk will have to be made both at the financial statement level and at account balance level. In case of Star Furniture, matters to be considered are integrity of management, unusual pressures on management and competitive environment. If the preliminary assessment of control risk is low, tests of controls will have to be performed as a basis for reduction in substantive procedures. The materiality level can be considered to be Rs. 28 million (5% of total assets) for balance sheet accounts and Rs. 8 million for income statement accounts (based on 5% of annual net income). Particular attention will be required for complex transactions and those accounts which involve significant judgments and estimates. A study will have ‘to be made for ethical code and management attitude and awareness towards internal controls. Unusual transactions will have to be noted. Selection of engagement team including time budget for engagement partner, manager and assistants. The client’s staff can be used for assisting routine audit matters. Consideration will have to be given of past profitability of Star Furniture and its liquidity position. Procedures should be performed to detect unidentified related parties. Time table for issuance of reports and other communication. Matters to be communicated to those charged with governance. The annual meeting is planned by march 31, 2012. 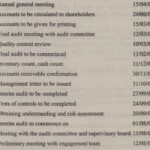 Financial statements will have to be dispatched to shareholders before March 9, 2012 (at least 21 days before AGM). If the fmal audit requires a month, the audit has to be commenced before February 9, 2012. The entity expects a management letter. 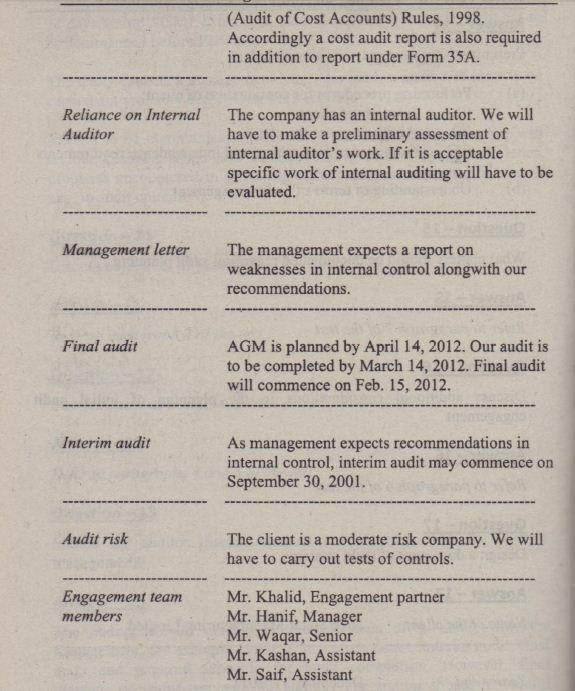 An interim audit will have to be carried out probably before October 31, 2011. Matters to be communicated with those charged with Governance will include planned scope and timings of the- audit management letter, problems encountered in gathering audit evidences and modification if any, in audit opinion. State contents of overall audit strategy and audit plan. The auditor – should discuss certain elements of planning with the management, for example, dates of inventory count, interim audit, final audit and required schedule for audit completion. However, final planning decisions rest with the auditor. The auditor should be careful that such discussions should not impair effectiveness of audit procedures. What constitute preliminary engagement activities. (iii) Compliance with ethical and independence requirements. (b) Understanding of terms of audit engagement. What matters should be documented regarding audit planning. Discuss additional considerations in the planning of initial audit engagement. Design a document of audit strategy. You are the manager in-charge on the annual audit of Decimal World limited (DWL) for the year ended December 31, 2009. DWL is a leading manufacturer of electrical appliances. 35% of its shares are held by Binary Limited (BPL). However, with the help of some consenting shareholders, BPL has been able to nominate 5 out of 8 directors on the Board. (a) A foreign investor has made a public offer to purchase 51% shares of DWL at a price of Rs. 13 per share. The share price has ranged between Rs. 12 to Rs. 14 per share during the past six months. 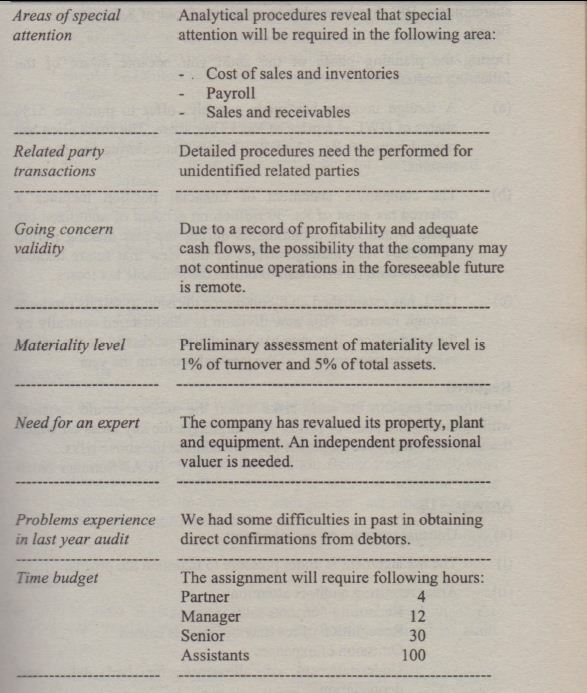 (b) The company’s statement of financial position includes a deferred tax asset of Rs. 30 million on account of unutilized tax losses which have accumulated during the loss making period 1999-2004. The management is of the view that future taxableprofits would be sufficient to utilize the available tax losses. (c) OWL has established an e-commerce division to sell its products through internet, This new division is administered centrally by the head office. This step has been quite successful as the online sales have risen to 20% of the total sales during the year. Identify and explain the audit risks which the auditor should consider while planning the audit of OWL. Also highlight the key areas on which the auditor should place emphasis upon, to address the above risks. (i) The management is under pressure to maintain the profits. – Understatement of allowance for bad debts and depreciation. (b) Deferred tax asset may not be recovered. (i) One of the conditions of recognition of deferred tax asset is that future taxable profits should be available against deductible differences. The entity has to demonstrate that future profits will be available for the un utilized tax losses. If sufficient future profits are not expected to be available, the deferred tax asset should be limited to the amount of profits that can be estimated reliably. – Risk of frauds by employees or customers. (a) What is the difference between audit strategy and audit plan? (b) You have been appointed as the auditor of a company which was previously audited by another auditor. Being a new client, what additional considerations would you take into account while performing the preliminary engagement activities prior to commencement of the audit? (a) The audit strategy sets the scope, timing and direction of the audit. It also provides guidance for the development of audit plan. The audit plan is more detailed than the audit strategy and it includes the nature, timing and extent of audit procedures to be performed by the engagement team members. The planning for these audit procedures takes place over the course of audit as the audit plan for the engagement develops. (i) Performing procedures regarding the acceptance of the client relationship and the specific audit engagement. (ii) Unless prohibited by law, arrangements to be made with the predecessor auditor, for example, to review the predecessor auditor’s working papers. these matters to those charged with governance, and how these matters affect the audit strategy and audit plan. (iv) The audit procedures necessary to obtain sufficient appropriate audit evidence regarding opening balances. 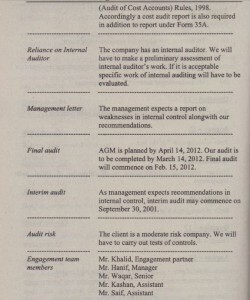 (v) Other procedures required by the firm’s system of quality control for initial audit engagements. Identify the prospective audit risks which the auditor should consider while planning the audit. The company may not be able to sell the inventories at no markup. Increase in number of days in inventory may indicate the risk that allowance for slow moving and obsolete inventories may have been understated. Significant decline in the above ratios may indicate that the company cannot meet its obligations. As a result, going concern validity may be doubtful. Decline in interest coverage indicates fall in profitability. In order to meet loan covenants the company may have overstated net profits and current assets. An increase in debtors turn over days may be indicative of understatement of allowance for doubtful accounts. In developing overall audit strategy, the auditor should assess inherent risk at the financial statement level. In developing the audit plan, the auditor should relate such assessment ·to material account balances and class of transactions. Stage of completion of work in process requiring high degree of estimation. Specialized inventories requiring assistance of an expert, for example, precious stones. Judgement involved in determining NRV. Susceptibility of certain inventory items for theft and pilferage. Pressure to overstate fixed assets. High degree of estimation may be required in ascertaining market price of unquoted investments. Complexity in estimates and computation of investment income. Susceptibility of loss for readily negotiable investments. Purchase commitments at prices in excess of market prices year-end.